The herb known as rue has been associated with magic and protection since ancient Roman times, if not longer. This plant was later fashioned into a charm, which is known today as the cimaruta. Decades of research and investigation now bring forth the most thorough and complete work ever published on the cimaruta charm. Author and scholar Raven Grimassi shares the old lore of Italy along with his personal insights about rue and the cimaruta charm. 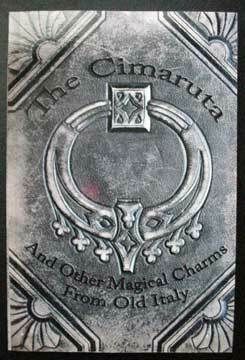 The author includes an exploration of the cimaruta charm in both folk magic and witchcraft traditions. Each of the symbols appearing on the cimaruta are examined and their meanings revealed. This modern work is sure to delight anyone interested in Old World lore, legend, and magic. This contains the most complete and comprehensive information on the cimaruta to ever appear in one source.In this book author, Raven Grimassi provides information about the Italian charm, the cimaruta, that is both historical, magical and folkloric. The book contains a chapter on witchcraft and magic in the time of ancient Roman writer, Horace, as drawn from a work of Historian J.F. Dalton.